With time, Windows raise an impressive number temporary files which slows system functioning. 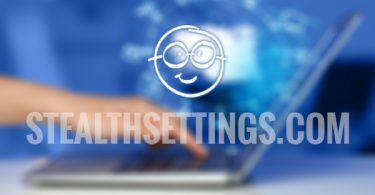 Therefore users are advised to use occasionally usefulness Disk Clean-upThat comes with OS, to high performance of Windows and to release space-bar pe Hard Drive. But most likely are enough users, like me, forget periodically clean up temporary files and then get angry because the system heavy work or are surprised that the space Partita which Windows is installed disappeared seemingly without reason. If you find yourself among those written above, the solution comes in the form of a applications which automates delete temporary files after a certain time. 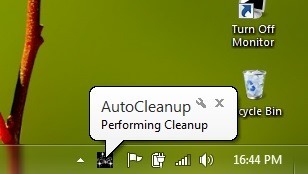 Auto Cleaner is a free application si portable (No installation required) that lets users automate regularly delete temporary files from your systemSo that it be kept in a optimal performance. Immediately after running the application, it displays a message that alert the user that deleting temporary files will be performed every hour 24. Auto Cleaner will run in background (With a minimum consumption of resources) and will place a icon in systray, Where users can closes the applicationOr can be manually cleaning temporary files. The application also displays Notifications that warns users when temporary files are deleted. 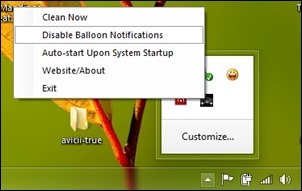 If that bothers you display these notification instructions, you can too disable Right-clicking Quick Auto Cleaner icon in the system tray and selecting Disable Notification Baloon. 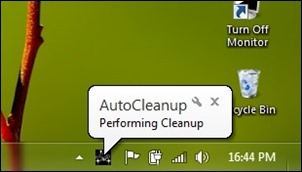 By default, Auto Cleaner will the system automatically deletes temporary files once at 24 hoursBut time may be changed depending on user preferences. All you have to do is edit .ini file CleanerConfig (Open with Notepad) Created in the same location with the program after its first release (you can select any interval you want, be careful transform interval in hours). Once you set new range, save the file .ini and restart the application.